Whether your skin is dry, sensitive, or oily— using clay can be beneficial, restorative, and balancing for your skin. We chit-chaated with the founders of PAAVANI to uncover all the different types of all natural clays that exist, and which ones are best for your specific skin type! 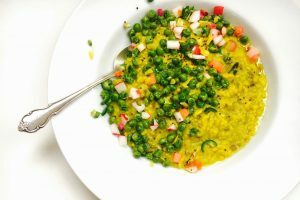 Each skin type corresponds with one of the ayurvedic doshas (vata, pitta, and kapha). Some have dry or more mature skin, also known as vata skin. Perhaps you more closely align with the pitta skin type – sensitive and prone to redness or breakouts. Or maybe you have really oily skin, and more closely identify as a kapha skin type. Whatever type of skin you have, we have you covered. Join us and learn about the different all natural clay remedies found in PAAVANI skin care products. What are some benefits of integrating clay into our skincare routines? Integrating clay into one’s skincare routine is a must! Clay has been used for centuries in many parts of the world to detoxify the skin by drawing out impurities like dirt and/or makeup. It also works by cleansing unwanted bacteria and fungus from the skin. Clay draws these toxins out while bringing essential vitamins and minerals deep into the skin’s layers. Due to these actions, clay is excellent for reducing excess oil or sebum which can lead to acne and/or breakouts. Clay also gently exfoliates the skin, sloughing off dead skin cells that can make the skin look dull and tired. Lastly, as clay is gently rubbed onto the skin, our lymphatic system is activated and circulation is increased, helping to bring a fresh glow to the skin. So, our question is, why not integrate clay into your skincare routine?! What are the different types of clay you use in your skincare products? We use Rhassoul, Bentonite and French Green Clay in our skincare offerings. Each clay has unique properties for each skin type. Rhassoul Clay we chose to use in our Vata Cleanser & Mask because we found it an ideal match for dry or mature skin types. This clay contains high levels of silica which helps boost collagen and elasticity while magnesium repairs dry, damaged skin. Rhassoul clay also works to eradicate clogged pores that contribute to stubborn blackheads due to its capability of drawing out impurities. It also improves skin tone and texture which is an important action for the dry or mature skin. Bentonite Clay is found in both our Pitta Cleanser & Mask and Tridoshic Cleanser & Mask because of its detoxifying, soothing and balancing properties. Pitta type skin can be described as sensitive, combination skin that is prone to redness, inflammation, and breakouts in the T-Zone areas. Tridoshic type skin can be described as balanced or healthy skin. Bentonite Clay helps to soothe and heal irritation while diminishing blemishes and/or breakouts associated with pitta type skin. The clay achieves this through detoxification. 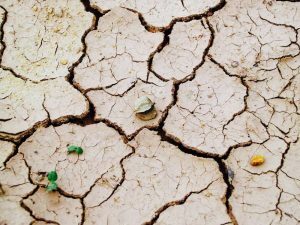 When combined with water, Bentonite Clay swells and has a negative charge, while toxins and impurities have a positive charge. This makes it easy for the clay to bind with the toxins and helps draw them out of the skin and body. Daily detox can also benefit balanced or tri-doshic type skin because it maintains overall health and clarity, removing impurities before they make their way deeper into the skin’s layers. French Green Clay is incorporated into our Kapha Cleanser & Mask and Clarify Cleanser & Mask due to its purifying, oil absorbing effects. Kapha type skin is prone to oiliness and congestion, while our Clarify line works to clear blemish prone skin. This clay is well suited to these lines because it is uniquely detoxifying to the skin due to its ionic charge. This charge acts like a magnet to extract toxins and remove them from the skin and body. It removes excess oil and unclogs pores. Further, it aids in the optimal function of oil glands which is important in order to not provide a breeding ground for bacteria that can lead to acne and/or blemishes. While powerfully detoxifying the skin, French Green Clay simultaneously softens skin and tightens pores. Lastly, French Green Clay boosts blood circulation while removing dead skin cells. Can any clay be used on any skin type? There are specific clays that work best for each skin type. Rhassoul Clay is best for dry and/ or mature skin. Bentonite Clay can be used for sensitive, combination to normal skin types. French Green Clay is beneficial for oily skin and blemish prone skin. Do we choose a clay based on our skin type or their action/benefits? At PAAVANI, we chose our clays for each line based on their actions and benefits. Their actions and benefits really determine which clay is best for each dosha or skin type. How often should one do a clay mask? Clay masks can be used daily as a cleanser or once per week as a mask. To use the clay as a cleanser, you would gently apply the clay in upward, circular strokes and instead of allowing the clay to dry, wash the clay off when it is still wet on the skin. This will exfoliate and cleanse the skin. For a deeper detox, use clay once per week and allow the clay to entirely dry on the skin before washing off with tepid, or slightly warm, water. Aside from water, can other forms of liquid be uses with your clay formulas? 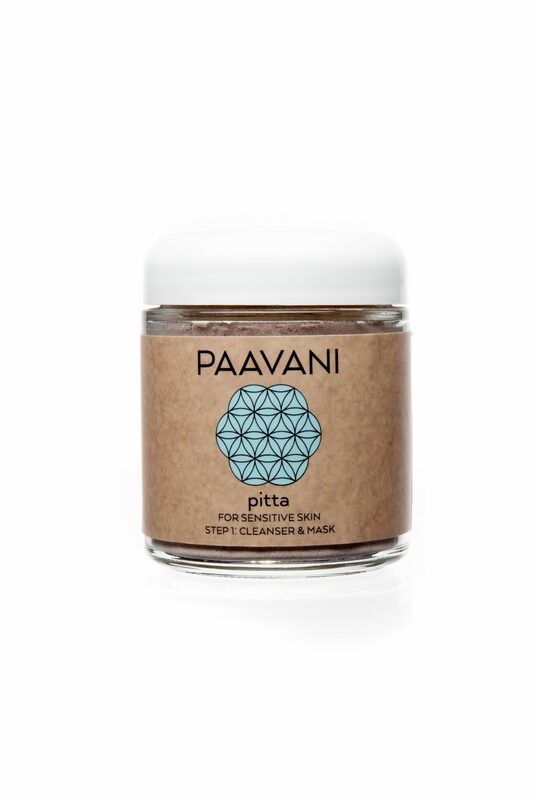 We recommend combining our clay and herbal based Cleanser & Masks with our PAAVANI Floral Water for a nourishing boost. The Floral Water contains deionized water, lavender, and rose which help to cleanse, soothe and even skin texture while minimizing pores and balancing the pH levels of the skin. We have also had people use apple cider vinegar combined with our Cleanser & Masks when they are seeking to further reduce acne and/or blemishes. Other folks have combined our Cleanser & Masks with our Facial Toners for a slightly more astringent effect on the skin. Ayurveda recommends combining whole cow’s milk with cleansers to bring moisture to vata type skin; however, organic dry cow’s milk is already contained within the PAAVANI Vata Cleanser & Mask, saving an extra step for people. Coconut milk is a beneficial liquid to use for pitta type skin because it soothes inflammation and the anti-bacterial properties of the milk help clear and prevent breakouts. This too is already pre-combined into the PAAVANI Pitta Cleanser & Mask, waiting for its benefits to be activated once mixed with water our Floral Water. For kapha type skin and for blemish prone skin, one may consider combining our Kapha and Clarify Cleanser & Masks with Manuka Honey. Manuka Honey has the prabhav, or special action, of oxygenating pores while removing dirt and bacteria. It also minimizes pores and draws out excess sebum, making it a powerful remedy for cystic acne. Is there a specific technique for applying and removing a clay mask? The most important thing in applying a clay mask is to get the right consistency of clay to liquid. It is easiest to mix our Cleanser & Masks in a small bowl, like our PAAVANI Facial Bowl & Spoon, in order to get the right consistency. 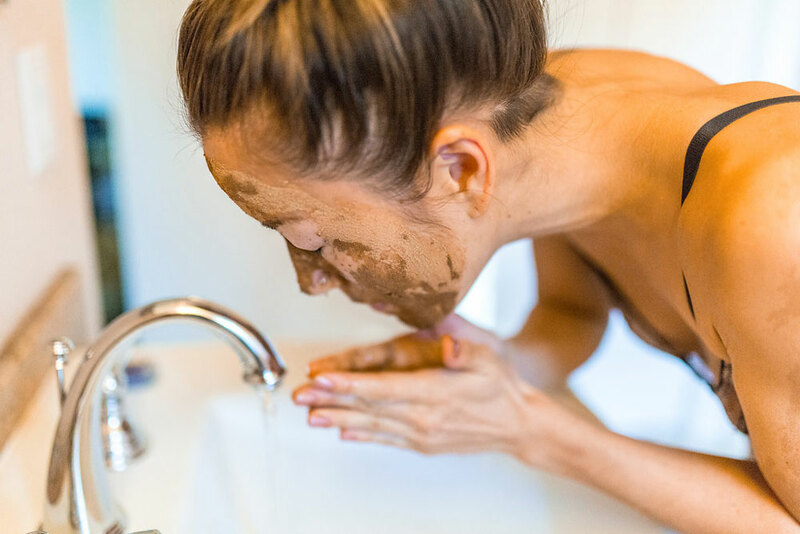 If you are looking to do a daily cleanse, we recommend using less clay to water ratio to create a thin paste that is still thick enough to stay on the face while you cleanse. For a weekly clay mask, add more clay to water ratio for a thicker paste, apply and keep on the skin until completely dry. When applying the clay to the skin, apply in very gentle, upward circular strokes. You could even try making small heart shapes with your strokes to infuse in the intention of self-love into this daily ritual. To remove the clay, we recommend washing it off with tepid or slightly warm water. According to the board-certified dermatologist, Jessica Krant, you do not want to rinse your face with hot water because it can actually be drying and/or irritating to the skin, while cold water does not cleanse as well as tepid or slightly warm water. 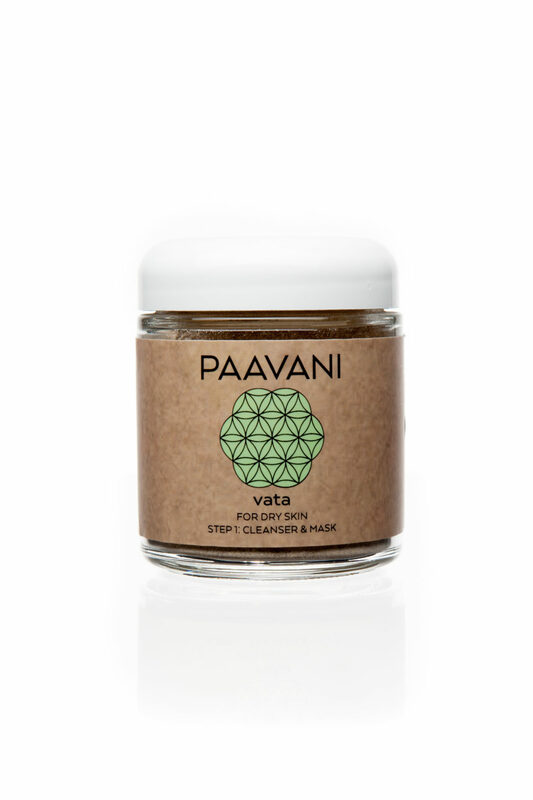 In addition to clay, PAAVANI masks include an array of herbs in your formula, what are the benefits of applying herbs to the skin? Like the various clays we use, each herbal ingredient blended into our Cleanser & Masks has a specific action and benefit. For example, licorice brings emollient or moisturizing properties into our Vata Cleanser & Mask, red sandalwood provides a soothing and cooling action into our Pitta Cleanser & Mask, bibhitaki gives an astringent effect into our Kapha Cleanser & Mask, triphala provides antioxidant protection into our Tridoshic Cleanser & Mask and Neem brings an anti-bacterial action into our Clarify Cleanser & Mask. Herbal powders bring vitamins, minerals and antioxidant properties to the skin and support the actions of the clays. Do you have a clay mask that works well for every skin type and one you would recommend for the cold season? If we were to recommend one of our Cleanser & Masks for every skin type, it would be our Tridoshic Cleanser & Mask. This Cleanser & Mask is just right like in the Goldilocks Tale because it is not too astringent and not too moisturizing. Its properties are right in the middle and are balancing, which can work well for various skin types. The Vata Cleanser & Mask is designed to protect the skin from the cold, dry qualities that arise during the fall and winter months. Thus, we recommend the Vata Cleanser & Mask to use during this time of year to help keep the skin supple, smooth and hydrated. 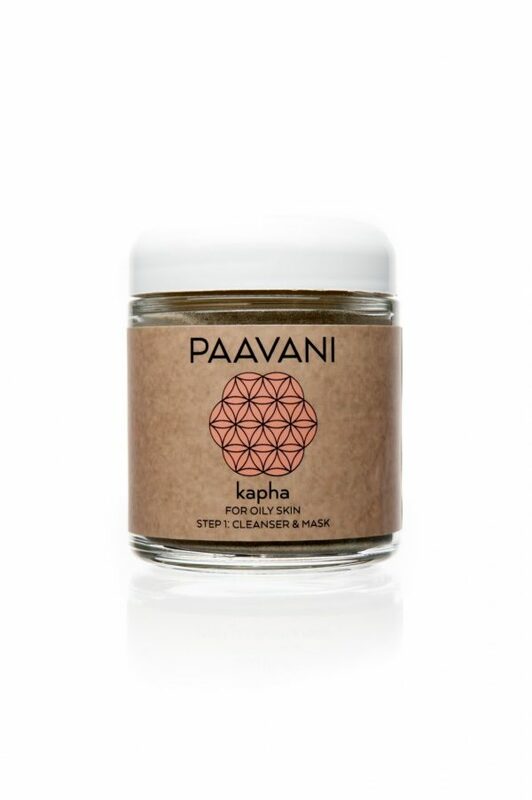 Co-founded by Ayurveda Practitioners, Leah Klatt, and Trudy Collings, PAAVANI Ayurveda is an artisan line of small-batch, pure, organic health and skincare products formulated in Northern California. 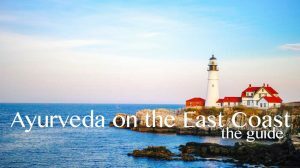 Handcrafted with the wisdom of Ayurveda, their products offer ancient traditions to the modern world, with the intent to reconnect people to their innate body wisdom.